Ffestiniog Railway. 1963/08/26, 01. 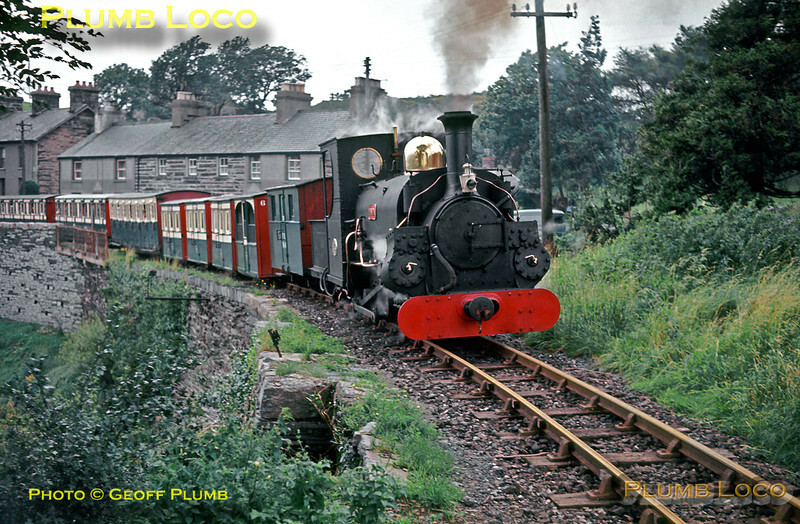 Ex-Penrhyn Railway Hunslet 1893 built 0-4-0ST "Linda", now running with an improvised tender, soon after arriving at the Ffestiniog Railway. She was later rebuilt as a 2-4-0STT with a proper tender and repainted in FR livery. She is in charge of the first train of the day from Porthmadog Harbour to Tan-y-Bwlch and is here just passing the level-crossing at Penrhyndeudraeth. The first few coaches were known as the "Bug-Boxes", some of the original 4-wheeled rolling stock of the railway. Behind them is coach No. 22, known as the "banana van" due to its sagging frames! The track is some of the old "double-head" chaired rails, most of which has now been replaced by new flatbottom rail. Monday 26th August 1963. Slide No. 267.